I have to admit that I never gave turtles much thought. However, last year, I met someone who constantly reminded me of a turtle, and not necessarily in a good way, I thought. Throughout the interaction, I kept on getting frustrated because this person from my perspective was ‘too slow’ in making decisions or taking actions, or ‘retreated into their shell at the first sign of conflict’. At the same time, this ‘turtle’ kept on showing me and reminding me that I did everything way ‘too fast’, and illuminated my short supply of patience. As time progressed, beyond thinking to myself that this person was there to teach me deep patience, I decided to deepen my exploration of what this ‘turtle’ came to teach me. Some of what I discovered, surprised me and had me reconfigure how it is that I see turtles. In our current reality, very often, we seek instant results. How many of us have not been lured in by promises to make changes in ’21 days or even 90 days’. Ted Andrews, in his book “Animal Speak”, says turtles symbolise longevity and wisdom. They’re in it for the long haul. They do not feel the pressure to hurry to get to the outcome, but rather are content to move with the current as they progress to where it is they are heading. For me, the power of this is that when we chose what we really really want, it has to be grounded in the wisdom of our past experiences and what our spirit deeply desires, rather than what we are being fed by our context. 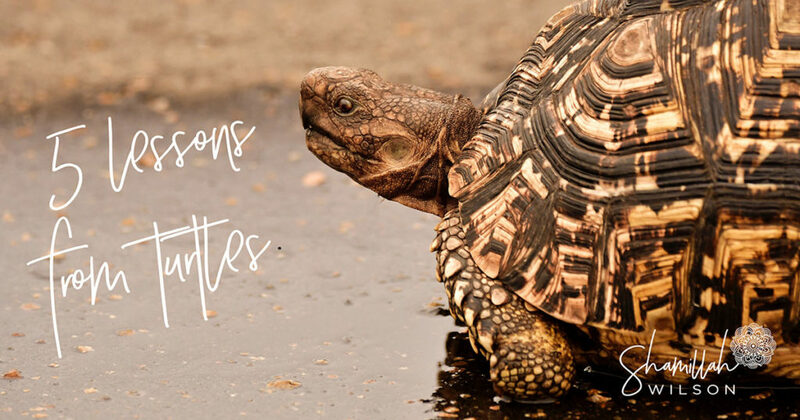 The second lesson that I learnt from turtles is that as they move in a particular direction if someone picks them up and turns them in another direction, the turtle retreats back into their shell and will resume on the path they had already chosen. For me, the value of this lesson is that countless times, as we share our dreams and visions, and when we come across obstacles, those around us may try to protect us and tell us to rather change our course. However, if we are guided by the way of the turtle, we realise that we have to trust our own authority and our vision. That even if we listen to other’s input, we should pause and then assess our own vibration and make a decision. All this has to do in an unhurried way. Many years ago, I would get very frustrated when viewing my progress against others’. However, the turtle doesn’t try to be the hare or to buy into the hare’s vision. In fact, the turtle appreciates that the hare has a different process, and like the hare also has a vision or goal to cross the finishing line. This is probably something that is worth reminding yourself of over and over again. You can only assess your pace and progress against your own framework and your own path, not the path of anyone else. Indeed, like all of us, the turtle has a shadow side. Pulling into itself and hiding, all of this may act as an excuse whilst relying on the knowledge that things happen as they happen, and just going with the flow. However, the turtle itself knows that in order to move forward, it needs to stick its neck out – it cannot make progress from inside its shell. Similarly, as human beings, we have to recognize that we cannot sit in our comfort zone, hoping that circumstances will propel us forward. Hoping that our environment or someone will push us forward. If we want to move forward, we do have to stick our neck out, we do have to stop hiding behind our fears, we do have to take those leaps. A saying I heard recently is that ‘it is better to try your best and fail than it is to not try at all and regret’. One of the excuses we often give ourselves is that we do not have enough knowledge, money, courage etc. As we stay stuck in indecision, we forget our inner resourcefulness. The turtle’s home is its shell. They never leave their home, but more importantly, their home never leaves them. They already have everything they need to survive and thrive. What this means is that anywhere we go, we have enough within us to move, to thrive, to grow. So our excuses are just that. My wish for you is that the way of the turtle inspires you as it did me. This entry was posted in Blog and tagged 056), 414), innerdevelopment (1, shamillahwilson (6), slowandsteadywinstherace (103.